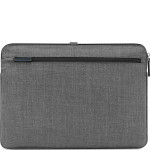 Collins MacBook Sleeve 11” is a smart and functional laptop case designed to give you confidence when on the move with your MacBook. Carry under your arm or slot into a larger bag, this protective sleeve has minimalist charm. Holding a laptop of up to 11”, the HDF Protection System offers peace of mind when transporting your technology. 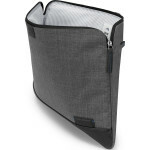 With a further zipped pocket for your tablet, it’s a multi-gadget sleeve that diligently defends your devices. Slot your laptop sleeve into a larger bag without worrying about knocks and bumps; high density foam padding provides superior protection for your gear. 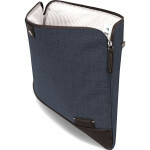 Suitable for a MacBook or device of a similar size, this sleeve is suitable for laptops up to 11”. From office to café, travel to boardroom, the chambray exterior and vegan leather trimmings give this case a professional appearance. The zipped pocket can accommodate a 10” tablet, e-reader or notepad, to keep your essentials organised on the move. Guard your device from scratches with the smooth microfiber lining, with an attractive pinstripe design to add to the style of the sleeve. Collins Macbook Sleeve 11” offers a dependable solution for your digital lifestyle. Bringing together Brenthaven’s unique high density foam protection system and contemporary design, it’s a stylish sleeve for your laptop. 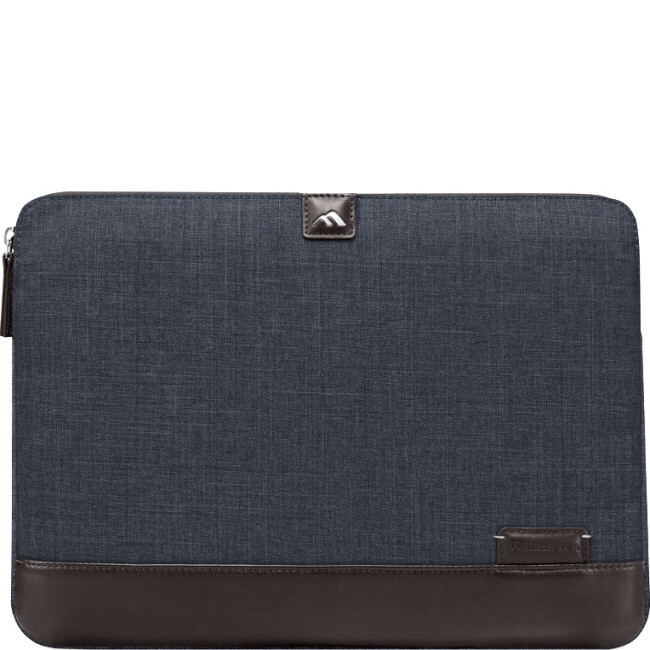 This slim laptop sleeve is the perfect size for a MacBook or similar device, with a smooth pinstripe microfiber lining and HDF protection to cushion your laptop. A further pouch to the rear holds a tablet or e-reader of up to 7”. 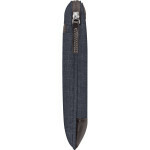 Both the main compartment and rear pocket have a fast-access zip. The modern and professional chambray exterior slots perfectly into urban surroundings, with faux-leather trimmings and genuine leather touch points. 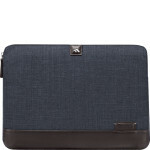 Carry between meetings or slot into your luggage, this slim laptop sleeve is a quality accessory to protect your tech. Brenthaven is renowned for creating low maintenance solutions for the digital world, to keep your tech secure for years to come. 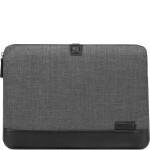 As with all of Brenthaven’s products, this laptop sleeve is protected by the company’s lifetime guarantee, so you can have confidence that your accessory will go the distance. Since 1980, Brenthaven has set the benchmark for technology bags and accessories, offering high quality solutions for the modern man and woman. Their products are carefully designed to safely carry your equipment for travel, commuting and days on the move, each with a lifetime guarantee. Fits laptops up to 11"